Drilling down even further into AMD's low-end graphics range is this overclocked version of the HD 5550. 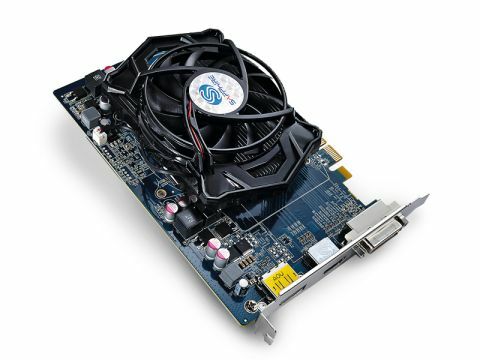 The original HD 5550 is almost as low as you can go with the current generation of GPUs without being effectively useless. This overclocked version, though, eschews the horrifically limiting nature of the 1GB of DDR2 memory and 128bit memory bus instant, opting for a far more speedy 512MB of GDDR5. Linked with that is another 100MHz on the clockspeed, boosting it from the fairly lowly 550MHz the stock card is lumped with. To cope with that, Sapphire has dropped an Arctic Cooling GPU chiller on board to keep both chip and memory in check. Unfortunately, that also has the effect of making the card itself a dual-slot beast, making it a little large for the small form factor crowd. That said, if your case can cope with its size then the fact it requires no extra power from the PSU makes it rather good for the wee media PC if you want some low-end, low-res gaming in the mix too. We managed to hit almost playable frame rates with Far Cry 2 and DiRT 2 at 1,680 x 1,050, on top settings with four times anti-aliasing. Far Cry 2 hit 20fps and DiRT 2 bettered that, hitting 25fps. With the third-party cooler too it ensured the GPU temperature didn't go above 54°C. If you're a little less precious about your gaming settings, or are playing on a 1,366 x 768 TV screen instead of your monitor, then you can get higher frame rates in your games of choice. Still, this really isn't a gamer's card, but something to add a little meat to a small form factor PC. If all you've got to add a little more 3D gaming to your rig is £65 then the overclocked HD 5550 is going to be a better bet than the 1GB DDR2 HD 5550 Ultimate. Don't be fooled by the higher cap.